If you are the second type of person, The Creativity Hub wants to push you a little further into the world of game design. Their new game BLANK is basically a starter pack for the interested designer; it provides a template to create rules and effects to make the game your own. The rules of BLANK are simple. Play one or more cards from your hand onto the discard pile, matching either the number or color of the top card. 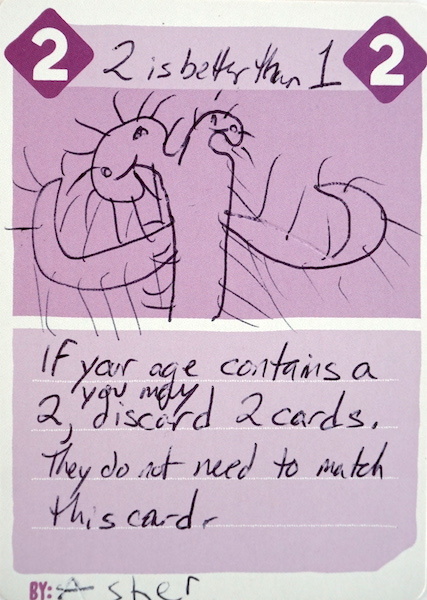 If you are unable to play a card, draw one instead. 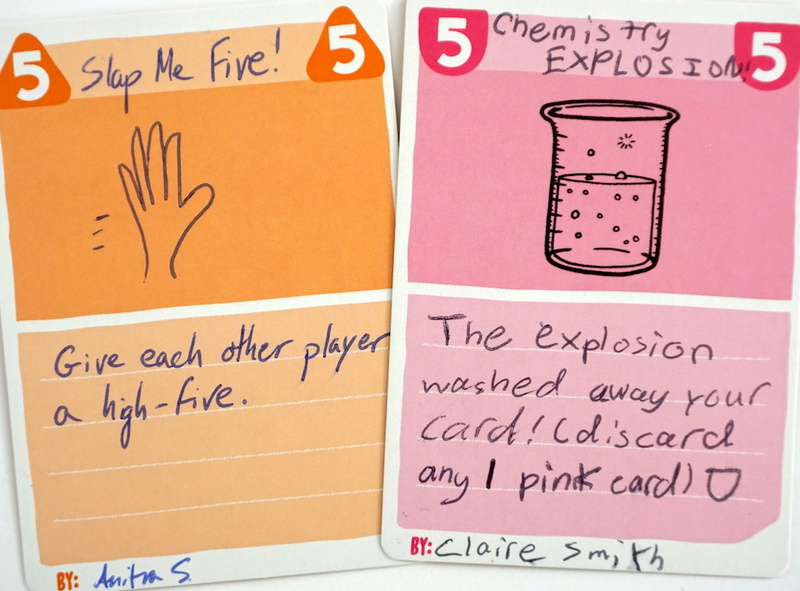 if you have ever played UNO, “crazy eights”, or Fluxx, game play will feel very familiar. There’s a twist to the game in the form of extra rules, however. 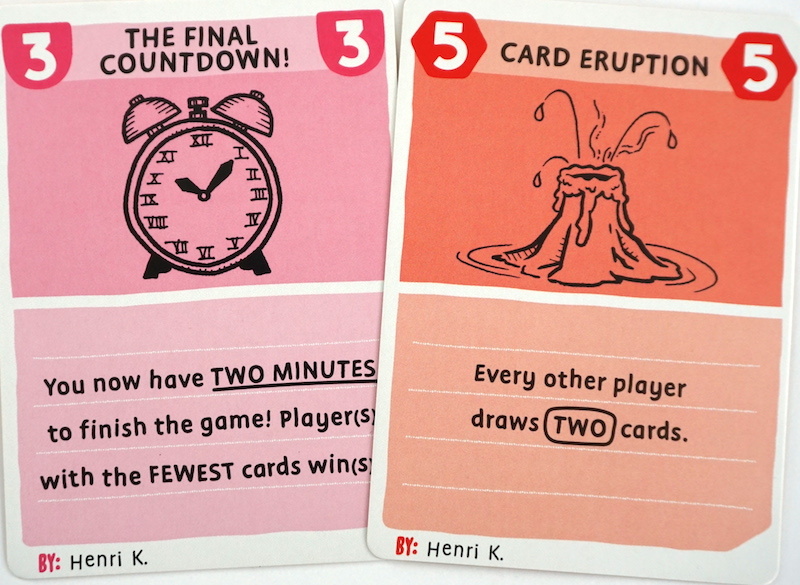 Three rule cards are in play at all times, each with a condition that must be followed. If a player does not follow one of the rules, they must draw a card. Playable cards may also have game effects on them; again, the penalty for ignoring an effect is to draw a card. A player may place multiple cards, as long as they all match in the same way (all match on the number, or all match on color). This is a significant change, because it allows a way to avoid an undesirable game effect: by playing it underneath one or more matching cards. The first player to play all their cards wins – as long as they haven’t broken a rule (requiring them to draw more cards). The winner gets a unique advantage – they get to modify a game card. This is where the game design aspect comes in. The winner may either create a new rule card to be added to the rules deck, or may customize a numbered card with a new game effect. BLANK is whatever you make it to be. In our house, it is quickly becoming a game that is about excessive drawing and discarding, with a few silly twists. But in other hands, it could be a very serious game. The first few playthroughs will seem fairly vanilla; as mentioned above, BLANK‘s default game is simple. This is an unfortunate side effect of the highly customizable nature of the game, since there are only 6 pre-made effect cards in the 72-card deck. However, since BLANK in its default state is compact and fast moving, it is easy to bring along wherever you go. We have played it in airports and restaurants, sometimes postponing the prize of designing a card until a later time. The real “game” is in the design aspect. BLANK provides both a template for trying new things and a method to quickly playtest new effects. The most important guideline, especially with kids, is to think through your card before beginning to write it down. How will this work early in the game? Late in the game? How would you feel if it was played against you? Creating new rules is the core of BLANK. 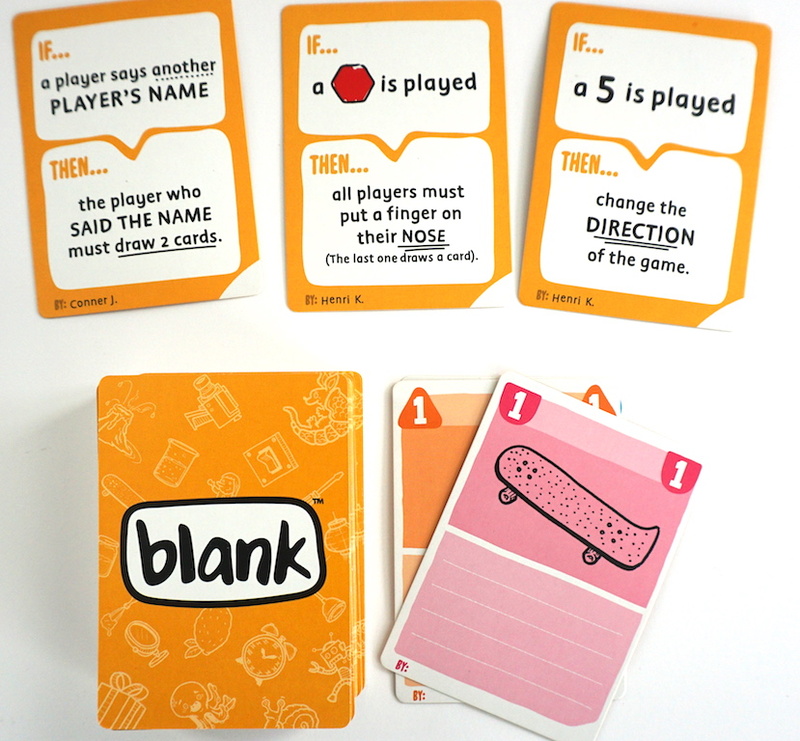 If writing on cards seems irreverent, or you are uncomfortable with permanent customization of your game, BLANK is probably not the right fit for your family. Above all else, BLANK is a game to stretch your creativity. Thinking outside the box will make your gameplay more fun! If you are stuck for ideas, check Twitter or Instagram for the hashtag #blankrules. There you can see a sampling of what other people have done with their cards. You’ll find everything from the supremely silly, to serious ideas on how to fundamentally change the mechanics of the game. Pick up a copy of BLANK for about $15 on Amazon, a perfect gift for the budding game designer in your life. The Family Gamers received a review copy of BLANK from The Creativity Hub.